As we hurtle towards Free Comic Book Day (May 5th) and the release of Transformers: Regeneration One #80.5 (the much requested continuation of the original Marvel Transformers comic series), the excitement builds, and my tongue gets correspondingly looser. To the extent that I recently blurted out all manner of stuff in an interview with TF fansite The Allspark. You can read said interview here. This Saturday, February 25th, I’ll be appearing in person at The London Super Comic Convention in the Excel Centre, Docklands, London. I’ll be there all day, with a permanent spot on the main convention floor as well as a signing at the IDW booth (at 4.45PM) and at 2.45PM I’ll be on the IDW panel with IDW editor-in-chief Chris Ryall and my Regeneration One co-collaborator Andrew Wildman. I’ll have comics, books and original scripts for sale/signature, and the convention-circuit debut of the unpublished script for issue #1 of Dreamwave’s aborted Beast Wars series (see below). Look forward to seeing/meeting some of you there! For more details, check out the LSCC site here. Back in 2004, as the year drew towards a close, I was busy writing two Transformers series for Dreamwave (holders of the Transformers license at the time): War Within – The Age of Wrath and Energon. Sure, you know all that, after all – I’ve talked enough about both here, and even ‘published’ some of my Energon story outlines. But what is less well known is that I was also at work on a third series, Beast Wars. Plans for this ongoing title had begun many months before. 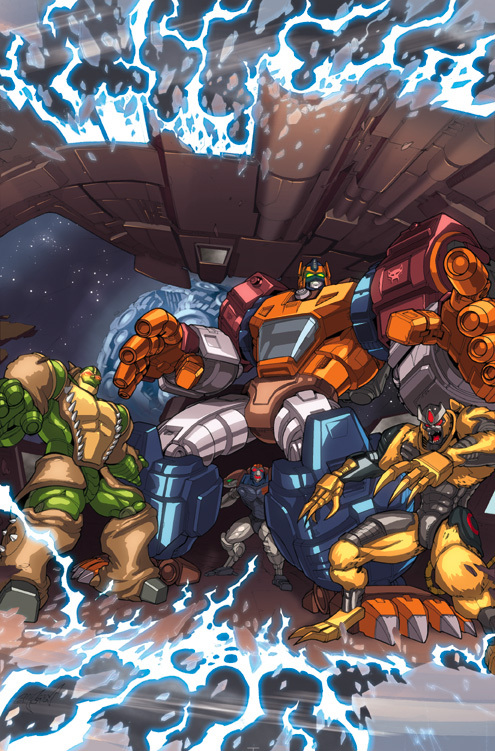 In the Dreamwave Summer Special, a Beast Wars ‘teaser’ tale (written by Brad Mick and Adam Patyk) was published alongside a Robots in Disguise (based on the animated TV show of the same name, and not to be confused with the current IDW comic series) short story. Readers were then asked to vote on which of the two they’d like to see more of. Beast Wars won. I wasn’t originally approached to write the series, even though I’d written the final episode of the animated show (Nemesis, pt 2), and that was fine. I was busy enough with Age of Wrath and Energon. But then, Brad (aka James McDonough) and Adam suddenly stopped working for Dreamwave. We weren’t told why (though with hindsight it was pretty obvious, as shortly after this Dreamwave declared themselves bankrupt and James had something of an inside track in the company), only that an urgent replacement was needed for their books. I quickly drafted a one-shot Jetfire story for the ongoing G1 comic (published on my blog a Christmas or so ago), and then got to work on Beast Wars. I had no idea what James & Adam had planned, and felt that something different and all me was the better way to go anyway. So I sat down and came up with something new, something that both continued the animated TV show (which was kind of tricky, as it reached a pretty definitive conclusion) and incorporated what had been set up in the Summer Special story (which again was kind of difficult, given I had no clue where James & Adam were going in the long term). Anyway, with much help and support from Beast Wars aficionado Ben Yee, I tapped a bunch of characters that had never made it into the show, including a kind of cool bad guy called Magmatron, and set about entwining two story threads, that would serve to pull the core TV show characters back to Earth (and pick up Rattrap’s ‘dream’ from the Summer Special), and kickstart a big new storyline that dealt with all the other Stasis Pod (and their protoforms) that had kind of got left behind on Earth. In the end, the first story arc was mapped out and two issues were written before $hit really hit the fan and Dreamwave closed its doors. Don (Figueroa) even drew the whole first issue — and it looked great! Of course, that wasn’t the end for Beast Wars. A few years later, I took elements from that aborted series and plugged them into what became The Gathering (for current Transformers comic publisher IDW). Anyway, having brought the scripts for (the unpublished) Age of Wrath #4 & 5 to light in the form of printed original scripts (for sale at conventions and elsewhere), I decided to unleash Beast Wars #1 (Dreamwave) this year. You’ll get to see quite how different things would have been, and how centric the core TV show cast would have been in the unfolding story. You’ll also get to see what I later salvaged for The Gathering, and how the Summer Special story got folded in. I’ll be toting the scripts around the country this year (see elsewhere and other blog entries for details), so come along and grab a piece of unpublished Transformers comics history. For those of you who can’t make it along in person, All The Cool Things, organizers of Roll Out, Roll Call, has copies available for purchase on their website – here. You are currently browsing the simon furman blog archives for February, 2012.